In 1854, Crimea was contested by the British and the Russians, and maybe the only bit of beauty that arose from that conflict was the poem by Alfred, Lord Tennyson, The Charge of the Light Brigade. I memorized it in 8th grade for a class project and it still gives me chills. This year Crimea is contested by the Ukrainians and the Russians, or the Nationalists and the Communists if you want to revive the WWII labels. Bitter hatreds still abound there as the factions recall the differing philosophies as communist versus fascist. Upon examination, I think the conflict might have been closer to being between those who were more opposed to Hitler versus those who were more opposed to Stalin. That’s a grisly choice of allegiances if you can’t see a third way. As a result of the tumult in Ukraine, the media is filled, again, with endless references to the false opposites of fascism and communism, left wing and right wing, neo-Nazis, neo-socialists, liberals and conservatives, collaborators and partisans . If you, like I do, find these discussions confusing and tedious, you would be lucky to meet Marcela. When I met her, she was standing in an alley in the rain bent over a Walgreen’s walking cane wearing a long, wet, once-wool sweater looking down at 3 bags of groceries on the ground. I asked if she needed help and she said, “Yes, thank you, I could use some help,” in heavily accented, but clear, English. She looked to be 100 years old, thin white hair, no babushka, bare feet in converse sneakers with cut out backs to be slip-ons, tattered slacks that were soaked to the knee. One of the bags had half groceries and half empty aluminum cans. They were too heavy for me to lift comfortably with one hand, and I shifted the load to two. “I only live on Wolcott, are you going that way?” she asked politely. Two and a half blocks… at Marcela’s pace that was time for a lot of conversation. The ensuing banter is paraphrased below. “I was arrested on October 4th, 1940.” It was the month of her 18th birthday she explained. She assuredly could have told me the hour and minute, but I didn’t ask. “They got Stalin when he was only 73. Poisoned him a little every day for 4 1/2 years, just a tiny bit every day. There was a discernible twinkle in her good eye as she reflected on Stalin’s demise, at a younger age than she. “His own people…Beria.” Soviet historians may debate the cause of Stalin’s death, but Marcela is certain. Her ramshackle frame and crumbling red brick house was a century old cave in the newly rehabbed block of fresh looking homes, the only color against the gray wood porch was a soaked and dirty Cookie Monster doll propped up as greeter. “No, I have a housekeeper. She has been with me for 4 years.” The housekeeper peeked out at our stair climb and looked also to be 100 years old. She didn’t whine, didn’t complain, didn’t seem the least bit sorry for herself. I think I’m a little jealous. I also don’t think she cared if Stalin was a communist or a fascist. Do you care? Please take our poll below to tell us what you think. 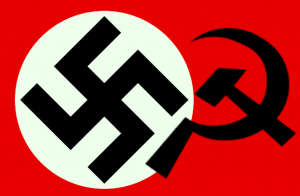 Are Fascism and Communism useful distinctions? Yes, They are very different. Left wing vs right wing. They are somewhat different, rich oligarchs versus worker oligarchs. It depends on the context , it may be useful to call them different names. I see philosophical distinctions , but in practice they are about the same. No, they are exactly the same. Two rival gangs fighting over turf. ← Chicago Dibs – Are dibs users bad neighbors? Marcela’s story brought tears to my eyes, that blurred the distinctions between the two sides.